Deb's Cup of Tea: Sunday's project finished. If I set myself a goal one of my big problems is not that I can't accomplish the goal, it's that I get down on myself, quite a bit, if I don't get it done. If life interferes with a goal, I can feel that it's hopeless to finish the task. It's one of my personality flaws, something I will always struggle with. It also could be argued that if I didn't pick a gigantic task such as "clean the basement", that is nebulous in scope and composed of a large number of smaller tasks, then I would feel as if I have accomplished something. I've tried to look at large tasks like "clean the basement" as a composition of smaller things; clean off the shelves on the west side, organize my tool area, remove unused boxes, as for instances; then the overall goal becomes much more attainable. Perfectly logical. I'm not logical. It may be crystal clear to you and muddy as the Mississippi to me. But, I set out to do a task on Sunday that I had been postponing. I have been griping to myself that I could never find decent sized food storage containers and that I would have to buy some at the end of this month. I made exquisite teriyaki chicken and rice for supper, including home made teriyaki sauce of which there is extra. I have enough leftovers for several lunches, which is a wonderful thing and it was just so good. Well, I needed the right size container and I couldn't seem to find lids, you know the problem. I decided I simply had to organize the containers. I wound up with two containers missing lids and that's it. The sizes I use the most often, lunch-size, I guess you'd say, have been moved to the front. The freezer boxes you see are going downstairs on the shelf unit. If I have the cash to buy something in quantity that requires boxes, I will know where they are. 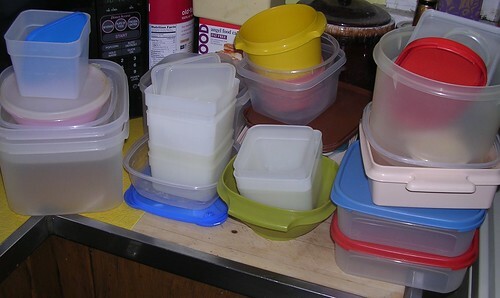 I don't need them upstairs with all the other containers. It was quite liberating, really. I have perfectly adequate storage, a delightful surprise. I don't need to buy anything. One task accomplished.